Welcome to our indepth review of the Earthwise LCS35814. Never heard of Earthwise chainsaws? You’re not alone, the Earthwise brand hasn’t been around that long – it’s only been around since 2006. I’ll give you a bit of a history tour through the company’s background in a while and this should enlighten you about the brand. Earthwise tools actually have a very long legacy behind them. This article is going to focus mainly on the Earthwise LCS35814 14” cordless chainsaw. We’ll be providing an in depth review of this great product. As a comparable alternative, we’ll also be reviewing the WEN 40417 16” cordless chainsaw which is cheaper than the 14” Earthwise chainsaw, making it a real bargain. WEN products are generally cheaper than similar products from other brands. Is the Earthwise LCS35814 a better chainsaw than the WEN 40417? One would hope so, since you’re paying more for a chainsaw with a shorter bar. I’d suggest reading the review of these chainsaws and decide for yourself. We all see value differently and there will always be those who can’t see the sense in paying more for a smaller chainsaw. What we will have to decide here is whether the Earthwise chainsaw is of a higher quality standard and if this is enough to justify the higher price. Going by the fantastic warranty offered on the Earthwise LCS35814, these guys are certainly confident that this chainsaw is going to outlast most other cordless chainsaws. Perhaps it will help if I shed some light on the brand before reviewing the Earthwise LCS35814. The heritage behind the Earthwise name has given me a greater respect for this lesser known brand. Even though you might not be familiar with the Earthwise brand, it’s very likely that you’ve heard of the American Lawnmower Company. This is more than just a company that’s been manufacturing dependable gardening products for over a century, it’s practically an American institution – a part of the country’s history. Back in 1895, when the American Lawnmower Company started manufacturing reel lawnmowers, no one would have guessed how the future of the company would change. The world has changed drastically since then and so has the products that we use. The first lawnmowers to hail from the company were handmade and their lineup of eight models cost between $2.20 and $4.75. So back then, you could a top of the line lawnmower for under five bucks, things sure have changed. Over the course of the twentieth century, the company had to change with the needs of the American consumer. They first branched into gas-powered mowers and then started developing electric garden tools of every description. For a company to survive for more than 120 years and remain at the top of their game, they have to evolve and keep up with what the public wants. This company has certainly done this. As we entered the 21st century, people have become increasingly aware of our environmental impact. From the global warming debate of 90s to the climate change awareness of the 2000s, everyone has become aware of the need to check our consumption and our impact on the world around us. This gave birth to the Earthwise brand. By 2006, the American Lawnmower company realized that in order keep up with worldwide trends, they needed to introduce a range of garden tools that were super-efficient. Earthwise products are designed to use as little electricity as possible and yet provide the power needed to give people what they expect from one of top manufacturers in the USA. Whether corded or battery-powered, Earthwise tools fulfill this mandate. By using, among other things, brushless electric motors, Earthwise tools not only save on electricity but last longer and are even more powerful than those that use conventional electric motors. They’ve implemented the best that modern technology has to offer in a bid to produce energy efficient tools that will stand the test of time. Variable speed trigger & a 14″ bar and chain. Excellent value. The Earthwise LCS35814 14” 58-Volt cordless chainsaw is the top model from the brand. While many other cordless chainsaws have a 16” bar and chain on their top models, this should not be our main concern here. Having 2” of extra bar length can be an advantage with thick logs, this isn’t all that we need to consider. What I’ve noticed about the Earthwise LCS35814 is that the company has invested a lot in making this their flagship chainsaw. In terms of power, it matches any gas-powered chainsaw of the same size and this counts for a lot. Even if you have a longer bar, if you don’t have the power to match, you’re not really gaining all that much. This is of particular importance when you’re cutting hard wood. Extra power means less strain on the motor and the ability to cut through hard wood easier and faster. So this should be consideration number one. If you intend using your chainsaw for hardwood, the Earthwise LCS35814 is likely to be the best cordless chainsaw for the job. Another reason why I rate the Earthwise LCS35814 so highly is the spec level and degree of quality that’s gone into this chainsaw. It’s on the higher end of the price scale, but it’s abundantly clear that the extra expense has gone into building a cordless chainsaw that’s as durable as the best. Their 5-year warranty is not only the best of all the chainsaws in the Earthwise range, it’s about the best in the entire industry. That says quite a lot to me. Includes battery and charger. Complete chainsaw package. My first impression of the Earthwise LCS35814 is that it’s engineered for quality. They have used high-grade plastic for the motor housing and some of the enclosures and quality metal where it really counts. The bucking teeth and bar housing are built from thick strong metal and this contributes a lot toward its durability. This combination of lightweight plastic and industrial-grade metal gives the Earthwise LCS35814 a great balance between user-friendliness and tough design. At a weight of 15-pounds it’s a little heavier than some, but still light enough to handle with ease. A fair amount of this weight lies in the 14” Oregon Double Guard 91 bar and chain. This bar is common to most of the best chainsaws and offers low kickback as well as extreme durability. The chain is self-lubricating (automatic oiling system) and it has a fantastic tool-free chain tensioner. I really like the large chain tensioning knob on the side of the Earthwise LCS35814, it smacks of quality and is easy to use. The brushless motor is one of the best, offering heaps power from the 58V 2AH lithium-ion battery that slots easily into position. The battery has a great one-touch button that activates an LCD display on the battery which tells you how much charge you have left. I always find it difficult to give battery working times for chainsaw. It’s not easy with any tool, but chainsaws have so many variables when it comes to your working circumstances. Depending on whether you’re cutting hard or softwood and the thickness of the wood, your working times differ greatly. It also depends very much on how you use the chainsaw, a skilled guy is going to work much more efficiently than a novice. I’m going to say that under average working conditions (if such a thing exists) you could get up to 30-minutes runtime from the battery. Most people who use a cordless chainsaw on a regular basis have more than one battery. The sensitive trigger control does a lot to extend the battery time. You don’t need to use full power if it’s not needed. The soft-grip handles are fantastic and do a lot eliminate vibration. They offer all the best gripping positions with a wrap-around design for the front handle. The chain guard that doubles up as a chain brake is equally great. It’s large, really tough and offers excellent protection. For a high-level of quality, the Earthwise LCS35814 offers it all and this worth paying for. At least it is in my opinion. Unfortunately, you never get power specs for a cordless chainsaw, so it’s hard to tell which performs better with absolute certainty. All I can say is that the Earthwise LCS35814 appears to be more powerful than most and this is a big advantage when you’re cutting hardwood. In terms of durability, I’d say that the Earthwise LCS35814 is up there with brands like Makita and DeWalt. The Earthwise 5-year warranty certainly beats either of the other two manufacturers that I’ve just mentioned. A 2-year warranty on the battery and charger is also way above the industry standard. This is, without a doubt, a purchase you can make with ultimate confidence in the quality and support that you’ll be getting. Includes 4-amp-hour fade-free lithium-ion battery. Includes Sheath to protect the bar and chain. When it comes to affordable tools for the home user, few brands can compare to WEN. In this light, the WEN 40417 40V Max is a fantastic chainsaw for the homeowner wanting to cut firewood and do the occasional garden clearing job. Though I wouldn’t place it in the same class as the more industrial-grade machines. The Earthwise LCS35814 is probably a better bet if you intend doing heavy-duty work and it will probably fare better on hardwoods. This means that the 16” bar used on the WEN 40417 40V Max is only really advantageous if you’re going to be cutting thick pieces of softwood. With that said, the WEN is a good quality chainsaw and won’t break easily. The brushless motor and 40V lithium-ion battery offer a good deal of power and the working time should be similar to that of the Earthwise LCS35814. While there’s no empirical proof of this, I think the Earthwise LCS35814 is the more powerful of the two. When we compare the weight, the WEN is 3-pounds lighter – it weighs 12 LBS. This is not a big difference and the WEN will be a little easier to handle if you don’t have too much forearm strength. Though if we look at this in more detail, we need to consider that the WEN has a longer bar than the Earthwise LCS35814. Both these chainsaws use a low kickback Oregon Double guard 91 bar. 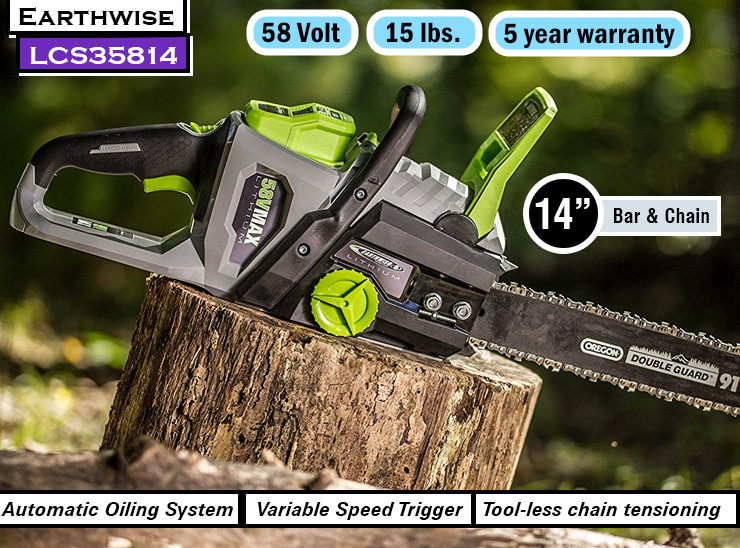 So one would think that the WEN 40417 should be the heavier chainsaw, given that it uses a 16” bar compared to the 14” bar of the Earthwise LCS35814. After all, much of the weight of a chainsaw lies in its bar. What this tells me is that the Earthwise LCS35814 uses more heavy steel in its construction – another indication that this is a heavier duty chainsaw. I wouldn’t be to put off by this, it just means that the WEN is intended for lighter duty work and the Earthwise LCS35814 comes closer to the industrial strength of the chainsaws used by professional lumberjacks. When it comes down to it, neither of these chainsaws can be fully considered as professional-grade chainsaws. The handle design and chain guard on the WEN is every bit as great as that of the Earthwise LCS35814. The WEN also has tool-less chain tensioning and automatic oiling. It has tool-free blade changing, using a large knob instead of two bolts like the Earthwise LCS358814. This tool-free system is very convenient but, again, it points to the more residential application of the machine. For the average guy who wants quick and easy blade changes, this system is great but it’s less durable than the old-fashioned bolts. When comparing the WEN 40417 40V Max to the Earthwise LCS35814, we need to look at what you intend using the chainsaw for. The WEN is slightly lighter and has the convenience of tool-free blade changes, it’s also quite a lot cheaper. I’d say that if you’re not going to use your chainsaw all that often and intend cutting mostly softwood or hardwood that isn’t too thick, you’d do well to buy the WEN 40417. After all, it’s cheaper and you probably don’t need to spend the extra cash on a heavy-duty chainsaw. If you’re going to be using your chainsaw more often and want a machine that’s probably more powerful, it’s worth paying extra for the Earthwise LCS35814. Their warranties also hint at the fact that the WEN 40417 is probably not built with the same purpose in mind. The WEN has a 2-year warranty.